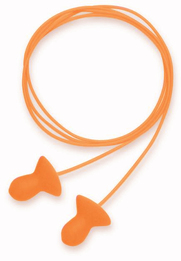 Howard Leight by Honeywell Quiet Corded Ear Plugs are also available with a sturdy carry case, or in an uncorded version. We also offer these Howard Leight by Honeywell Quiet Ear Plugs in a natural beige color, which is uncorded and average size only. Howard Leight by Honeywell Quiet Reusable Foam Ear Plugs Corded No Case (NRR 26)5Jill A.March 5, 2013I've been using this brand and type for more than seven years and they are my absolute favorites! They are super comfortable, easy to insert, easy to clean, and a pair lasts a long time. Plus, they're orange!!! My company stopped keeping these in stock, so I buy them for myself. They are the best! Howard Leight by Honeywell Quiet Reusable Foam Ear Plugs Corded No Case (NRR 26)5Alice EscotoJanuary 28, 2012Great ear plugs.